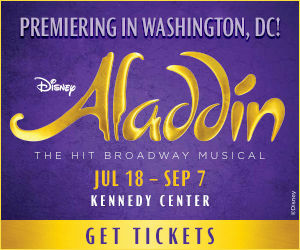 Be the first caller at 855-885-1035 to correctly identify the mystery newsmaker and win a pair of tickets to see Disney’s Aladdin, the hit Broadway musical, at the Kennedy Center on July 18th. Discover a whole new world at Disney’s Aladdin, the hit Broadway musical! From the producer of The Lion King comes the timeless story of Aladdin, a thrilling new production filled with unforgettable beauty, magic, comedy, and breathtaking spectacle.